I came across these two items on the same day, not far from each other, and was struck by the disparity of their circumstances. One of them sits there all clean and neat, its plug laid carefully on top. There’s even a lime lying in the gutter next to it, as if Nature itself has leant a hand by providing a little green garnish (none of these photos are staged by the way, all are exactly as found in situ). 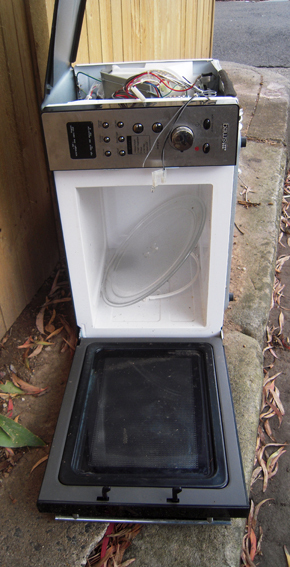 It’s perhaps not something I would pick up and take home with me, but full marks for having a go, for making a dumped microwave oven look passably attractive. The next one tells a very different story; on its side, side panels ripped off and innards showing, the door gaping wide open and its cavity exposed for all the world to see. This oven has been plundered, ravaged, fit now only for scrap and spare parts. Two very different ovens then and, it struck me, two very different attitudes to life after death, as distinct as embalming and cremation. On the one hand, the discard is kept physically intact, perhaps even functional, in the hope that it will be taken up in another life, another world, to fulfil its destiny. On the other, the material carcass is merely the sum of its parts, suitable only for breaking down and dispersing. It will never again operate wholly and in its entirety. And who is to say which is best? Reuse or recycle? Resurrection or reduction? I guess it depends on what scale you use, whether you view things in terms of the particular or the particle. In general, I lean towards the latter, the idea that we are all, to some extent, just momentary combinations of atoms and that, on some fundamental level, it makes no difference if we are connected or dispersed. Of course, there are some very useful and enjoyable combinations of particles. Microwave ovens that heat. Beer that tastes nice. Human beings who laugh, sing and love. These are all important things and should be appreciated for what they are. But none of them can exist as they are for eternity. Everything decays. Somebody once pointed out to me that, over the course of several billion years, apart from a few bits of satellite and space junk, nothing material has left Earth. Everything is still all here, reconstituted and re-combined maybe but hardly diminished. Despite all the talk of ‘waste’ and ‘loss’, nobody is going anywhere. We are all stuck here. Humans. Beer. Microwave ovens.